Apologies Edith & Ian Wilson, Carol Jeffs, Janice Grey, Yusuf Khalfan, Paul McKenna & Rowan Huxtable. Guests Bruce Wilson from Philippine volunteers team & PP Ken Jackson from past RC Central. Birthdays Peter Hill ( Wed 1 November). Director of New Generations, Elaine Hart attended St Mary’s and listened to an absolutely marvelous presentation by our Ryla student, Isabella Martin, to the whole assembly. Very well done. We currently have 290 attending & have our MC available again. Prizes are coming in to help fundraising on the day. An interesting one is a Wing Walk for 4 people from Michael Howe & Hars (normally $65 p/p). Swing into Wings (reported Tony McAdams) will be a good classy event. The aim is to keep it new & different every year. Save the date in 2018 – Saturday 5 May. A big thank you to Peter Hill, who in his own words, has been ‘flogging chocolate’ to workmates at Wollongong Uni. 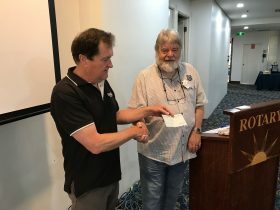 Peter presented a cheque for $2,000 towards the autism research project.